Making Dutch oven bread is not hard, is fun, and best of all, it tastes amazing. Be aware though that, bread making takes time, so plan to be there for the dough. I plan to be a home body on days when I make bread. There are many recipes that can transition from indoor to outdoor. One such recipe is this indoor Dutch oven recipe from Lecreuset.com. The reviews on this recipe were good, so it looked like it was worth trying. What I really like about this recipe is that it is simple and easy to make. The directions call for using a stand mixer, so the challenge when making this Dutch oven bread outside is figuring out how you are going to mix it. When I made this in my Kitchen Aid Stand Mixer (as the directions called for), it was pretty easy. The dough did get pretty thick and was working the mixer pretty hard. So expect a bit of a workout when mixing this by hand. Kneading bread outdoors can be a challenge. First, since space and a clean surface are needed to work, it is recommended to use a large wooden or plastic cutting board. A large cutting board will not only afford enough surface area to knead the dough, but it will also offer a clean surface on which to work. To keep the board from sliding as you are kneading, place a damp towel underneath it. Second, the other option is to find a no-knead bread recipe. I have to admit, I have never tried a no-knead recipe, however, it is probably in my future. I’m a little old-fashioned, I like the task of kneading bread dough. It is therapeutic and relaxing. I can see the advantages of no-knead Dutch oven bread recipes for simplifying the task of making it outside. Less mess, equipment, and hassle. If you are looking for a good no-knead recipe, I love what Pinch of Yum does. I plan on trying this recipe in the Dutch oven someday soon. The recipe calls for removing the lid in the last 15 minutes or so of the baking process. If you are baking this outside with coals, you will not be able to do this. To fix this issue, try adding a few extra coals on top in the last minutes of baking. In addition, it is possible to extend the baking time for the coals on top by a little longer. Browning food in a Dutch oven usually is not a challenge, so this is an easy fix. Just something to keep an eye on in the final baking moments so the bread is cooked just the way you like it. 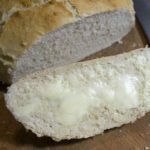 Perfectly baked Dutch oven bread. 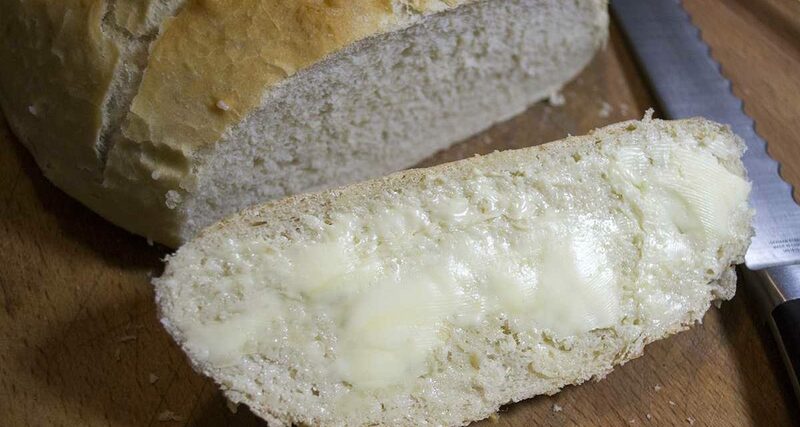 This recipe is quick and easy (well, quick in terms of bread) and tastes great. One of the things that drew me to this recipe is that it only took 2 to 4 hours to rise. Many of the bread recipes had rising times of 10 to 14 hours. Delicious Dutch oven bread, fresh from the oven. A delicious slice of Dutch oven bread. Finally, when I made this, there was no sea salt or Kosher salt anywhere in the house. Adding salt to the top does add some nice flavor. Since we had pretzel salt, I used it instead. Pretzel salt may be a bit overpowering since it is coarse with large grains, but it still tasted great. In any case, adding salt to the top before baking is purely optional. Fresh bread is great anytime. Enjoy bread outdoors with this delicious recipe. Combine the flour, water, yeast, and salt in the bowl of a stand mixer fitted with a dough hook. Mix on medium speed until the dough is smooth and elastic, 5 to 10 minutes. You may need to stop the mixer and remove the dough from the dough hook if the dough is not developing thoroughly. When the dough looks smooth, cut off a piece and stretch it. If it stretches to the point of transparency, it’s mixed enough. If not, continue mixing. Turn the dough out onto a work surface and knead it for about 5 minutes to release the gas and redistribute the yeast. Shape it roughly into a ball, place in greased Dutch oven and cover it with the lid, a towel, or plastic wrap. Allow the dough to rise again, 30 to 60 minutes (less if it’s very hot and humid, more if it’s cold). Preheat the oven to 450 F. or prepare your coals if baking outside. Baste with 1 tablespoon olive oil, or more if you like, gently over the surface of the dough. Score the bread with a sharp knife or razor, making an X or a hash mark; this will allow the dough to expand freely. Sprinkle the dough with salt. Cover the pot and place it in the oven. After 30 minutes, remove the lid, reduce the oven temperature to 375 F, and continue baking until the bread is nicely browned and cooked through. It should have an internal temperature of 200 F or so when done. If you are baking this over coals, be sure to leave the lid on and check for browning. If needed add a few more coals to the top of the oven to brown the bread.